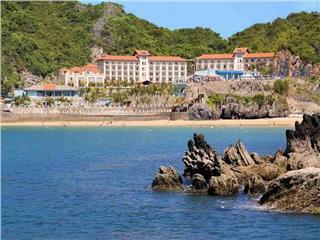 Cat Ba Island Resort & Spa is one of the best Cat Ba resorts located at Cat Co Beach. Having 165 rooms with 8 different choices, Cat Ba Island Resort & Spa is one of ideal dwelling places to relax and discover the island. 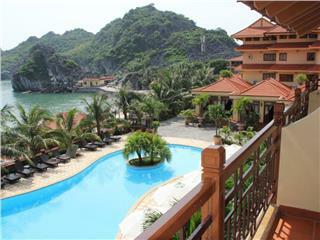 Cat Ba Island Resort & Spa is located at Cat Co 1 Beach, Cat Ba Island, Halong Bay. This is one of the best resorts in Cat Ba having 165 rooms with 8 different choices. Generally, all room types are well outfitted with basic amenities such as minibar, TV, desk, dressing table; armchairs, luggage rack, wardrobe, safety box, etc. Being known as one of resorts in Cat Ba Island, Cat Ba Island Resort & Spa is outfitted with facilities and services involving air conditioned, electronic safe in room, IDD telephone, grand ballroom, conference facilities, outdoor swimming pools, Water Park, bar and restaurant, etc. Cat Ba Island Resort & Spa has 165 rooms offering eight choices for guests involving Superior Ocean View, Superior Mountain View, Deluxe Ocean View, Deluxe Suite Ocean View, Deluxe Suite Garden View, Grand Deluxe Ocean View, Family Suite Ocean View, and President Suite Ocean View. Normally, all room type have balcony to offer guests panoramic view of the bay & ocean. The basic facilities in each room including minibar, TV, desk, dressing table; armchairs, luggage rack, wardrobe, safety box; slippers; kettle and complimentary well set-up tea, coffee, and 2 purified water bottles. In bathroom, guests can find necessary toiletries such as shampoo, body lotion, soap, towels, toothbrushes, etc. Exquisitely designed to offer a panoramic view of the ocean and beauty full garden view, offering two bed rooms and living room which is suitable for family. Luxury accommodation with spacious living room; bed room, sunbath at the verandah, excellent furniture and amenities. Being known as one of 4 star resorts in Cat Ba Island, Cat Ba Island Resort & Spa offers guests modern facilities and advanced services following the international standards. Staying in Cat Ba Island Resort & Spa, guests can keep fit by practicing in the fitness center, entertain at game room, go swimming at private beach or outdoor pool, and play tennis and other water sports offered by the hotel. Like other Cat Ba 4 star resorts, Cat Ba Island Resort & Spa also offers different types of spa and massage for guest’s relaxation. In addition to activities in the hotel, there are many interesting excursions awaiting in Cat Ba Islands – the most beautiful and largest islands in Halong Bay. Let’s explore and experience in your own way. Cat Ba Island Resort & Spa, one of the best resorts in Cat Ba, has a sumptuous system of bar and restaurant to serve the culinary delights of guests involving Seashore Restaurant, Splash pool, Terrace, Fun Pub, and Pirate’s Bar. + High season: from 8 April to 2 September. 30 April, 1 May will be considered as Fri, Sat of high season. 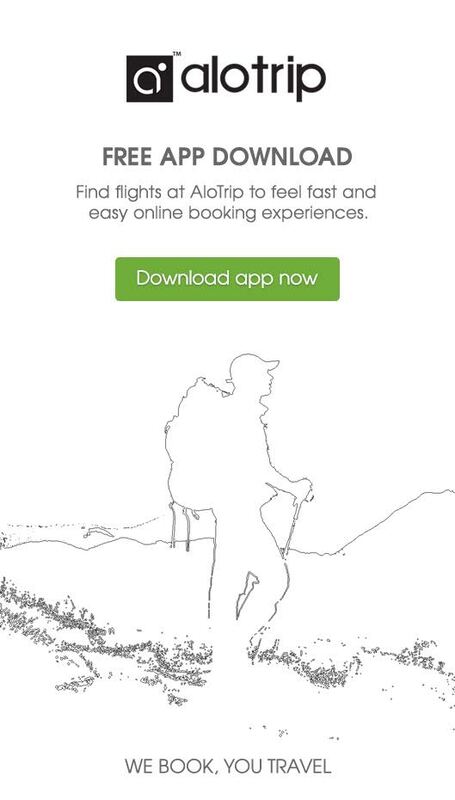 - Check in time is from 14:00, and check out time is by 12:00 noon. + 12:30 – 15:00: 30% of one night room charge. Cancellation policy will vary depend on room types and time of booking. Being known as one of best resorts in Cat Ba, Cat Ba Sunrise Resort is an ideal dwelling place for travelers to relax and explore the islands. Staying here, travelers can enjoy secluded, luxurious, unique, and breathtaking beauty of a paradise resort.